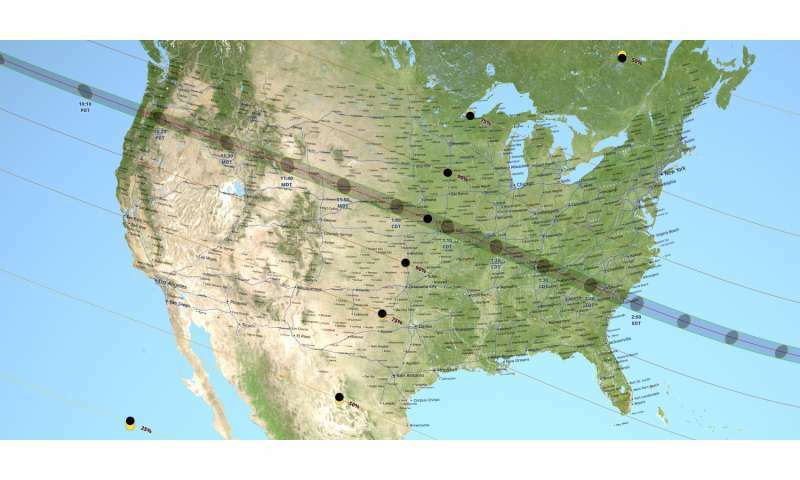 "When the moon blocks out the sun during a total eclipse, those regions of Earth that are in the direct path of totality become dark as night for almost three minutes," said Steve Clarke, director of the Heliophysics Division at NASA Headquarters in Washington, D.C. "This will be one of the best-observed eclipses to date, and we plan to take advantage of this unique opportunity to learn as much as we can about the sun and its effects on Earth." The August 2017 total solar eclipse will provide a unique opportunity to study Earth, the sun, and their interaction because of the eclipse's long path over land. The path of the total eclipse crosses the U.S. from coast to coast, so scientists will be able to take ground-based observations over a period of more than an hour to complement the wealth of data provided by NASA satellites. The 11 NASA-funded studies cross a range of disciplines, using the total solar eclipse to observe our sun and Earth, test new instruments, and even leverage the skills of citizen scientists to expand our understanding of the sun-Earth system. The studies are listed below, followed by the name of the principal investigator and their home institution. During a total solar eclipse, the moon blocks out the sun's overwhelmingly bright face, revealing the relatively faint solar atmosphere, called the corona. Scientists can also use an instrument called a coronagraph - which uses a disk to block out the light of the sun - to create an artificial eclipse. However, a phenomenon called diffraction blurs the light near the disk in a coronagraph, making it difficult to get clear pictures of the inner parts of the corona, so total solar eclipses remain the only opportunity to study these regions in clear detail in visible light. In many ways, these inner regions of the corona are the missing link in understanding the sources of space weather - so total solar eclipses are truly invaluable in our quest to understand the sun-Earth connection. Total solar eclipses are also an opportunity to study Earth under uncommon conditions. The sudden blocking of the sun during an eclipse reduces the light and temperature on the ground, and these quick-changing conditions can affect weather, vegetation and animal behavior. As this great event draws near, the public should keep keep this important safety information in mind: You MUST use special eclipse safety glasses to view a partial eclipse and the partial phases of a total eclipse. To do otherwise is risking permanent eye damage and even blindness. The ONLY time it's safe to look at a TOTAL eclipse without proper eye protection is during the very brief period of totality when the Sun is 100 percent blocked by the Moon. If you're in a location where the eclipse won't be total, there is NEVER a time when it's safe to look with unprotected eyes.